The top is special. It is the heaviest quark by far – more than thirty times heavier than any of the other quarks. According to the Standard Model, the monsterously heavy top quark should acquire all this mass through its interaction with the Higgs field. The theory tells us that the top is so heavy precisely because it feels the Higgs field more strongly than any other particle. We can test the theory by making an experimental measurement of the strength of the relationship between the top quark and the Higgs field. To do so we must look at how often a Higgs boson gets spat out when top quarks are produced. This is known as “associated ttH production”, and it has just been measured by the ATLAS experiment at the LHC. The early results are in and are consistent with expectations – so far. But the uncertainties are very large – about 60% – so there’s plenty of room for something odd to be going on. Any deviations would be very interesting. They might tell us that part of the mass of the top quark came from another source, such as the additional Higgs bosons required by many extensions to the Standard Model. 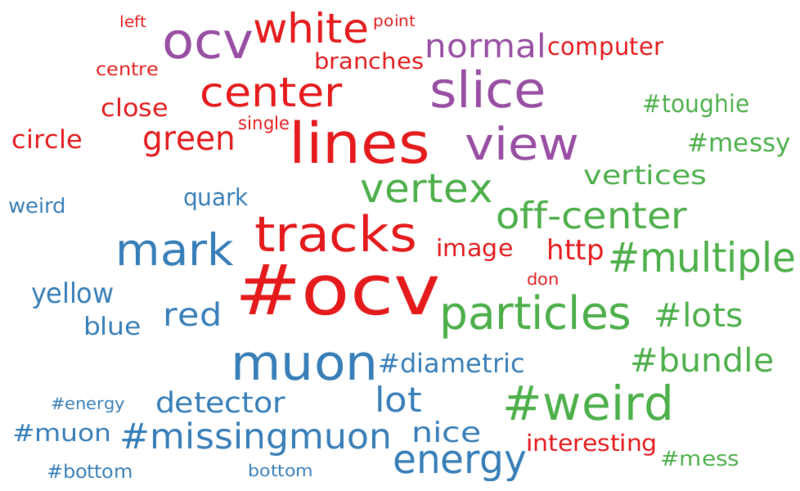 Unsurprisingly #ocv is the top-ranked hashtag as people indicate they’ve found an off-centre vertex. As we might expect, citizen scientists use descriptors like “blue” or “white” to describe objects in the images, and then there’s also a good deal of further analysis, with words like “branches”, “center” and “detector”. Clearly some images are hard to interpret as they’re #messy, or otherwise generally a #toughie. Fortunately at least some are “interesting”! It is great that there’s plenty of particle physics technical talk of “muon”, “quark”. I love even more that the hashtag “#bundle” has developed its own meaning within the HiggsHunters community, even though it’s not one used in the generaly particle physics jargon. Clearly the Zooniverse’s citizen scientists are developing their own technical vocabulary for the images. So my next job is to go out and understand those new terms…! Over the summer, we put together a paper on the HiggsHunters project and your performance, and it’s now been submitted to a journal and the arxiv preprint server – have a look! One highlight is a discussion of your ability to identify Off-Centre Vertices compared to reconstruction algorithms, and in a substantial fraction of cases you do a better job! Out of nine different types of simulated “baby bosons”, you outperform the computers for three and come close on a further three. Below is an example of one of the cases where you do best compared to the reconstruction algorithms, with different coloured points representing different ways of clustering your clicks, for example varying N_clicks = the number of you who clicked on a given location. It’s clear you can identify vertices more efficiently (points further to the right) and with fewer false identifications (further down) than the algorithm – marked by a black star – so well done! We also talk about your abilities to spot interesting and unexpected features, for example the muon jet. A figure from the paper, comparing vertex-finding abilities of citizen scientists (coloured points and lines) and reconstruction algorithm (black star) for a particular simulation type and image view. This bodes well for the next steps, where with the help of researchers in schools we’ll further optimise the combination of your clicks and then apply the lessons learned to see what we can uncover in the actual data! As part of the legacy of the HiggsHunters project, school children in the UK and around the world are being given the chance to search in the HiggsHunters data for new particles. Getting schools doing cutting-edge research is the brainchild of the amazing school teacher Prof Becky Parker, who has set up the Institute for Research in Schools to bring real search from NASA, CERN and elsewhere to schools. We launched the project to an audience of Scottish school kids and their teachers at the Royal Society of Edinburgh on 16th September. 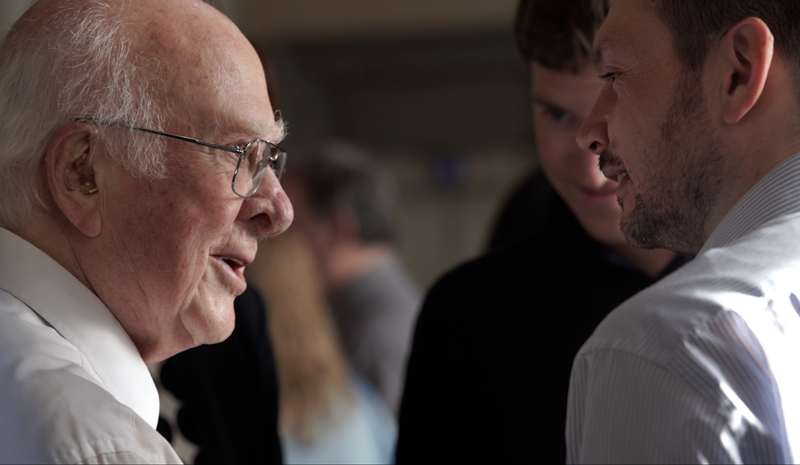 The expert panel answering their questions contained one particularly famous face in the field – Prof Peter Higgs himself. Happy Birthday to the Higgs Boson! Today we’re helping the Higgs celebrate its fourth birthday! 4 years ago today, on 4th July 2012, the ATLAS and CMS collaborations each presented complementary results on two searches for the Higgs boson, prompting CERN Director General Rolph Heuer to pronounce “I think we have it!” Here at HiggsHunters we’re also celebrating your millionth click from over 580,000 image classifications, a fantastic achievement from everyone that’s also been recognised by our friends at CERN. We’d also like to say a huge thank you to everyone who replied to our survey a few weeks ago – it’s great to know what brought you to the project and what you’ve learned from it, and also how you think we can improve things. Over the next few weeks we’ll be putting the finishing touches to a first analysis of your image hunting, and a final burst of inspection will really help us make the most of it. Stay tuned to see some results from all your hard work, but for now enjoy some of our celebrations below! All gone except for a lone muon. Stuffed! Here are a few (of many!) nice examples where you’ve collectively outperformed the reconstruction algorithms to find some Off-Centre Vertices in simulation. 7 clicks from 7 people (marked with pale blue dots) form a cluster (orange dot at (420,590)) right on top of one the ‘truth’ (i.e. real, from simulation) OCVs (yellow dots) – well done! Here 3 people have together identified both OCVs – the orange dots are hidden underneath the yellow ones since they’re spot on! 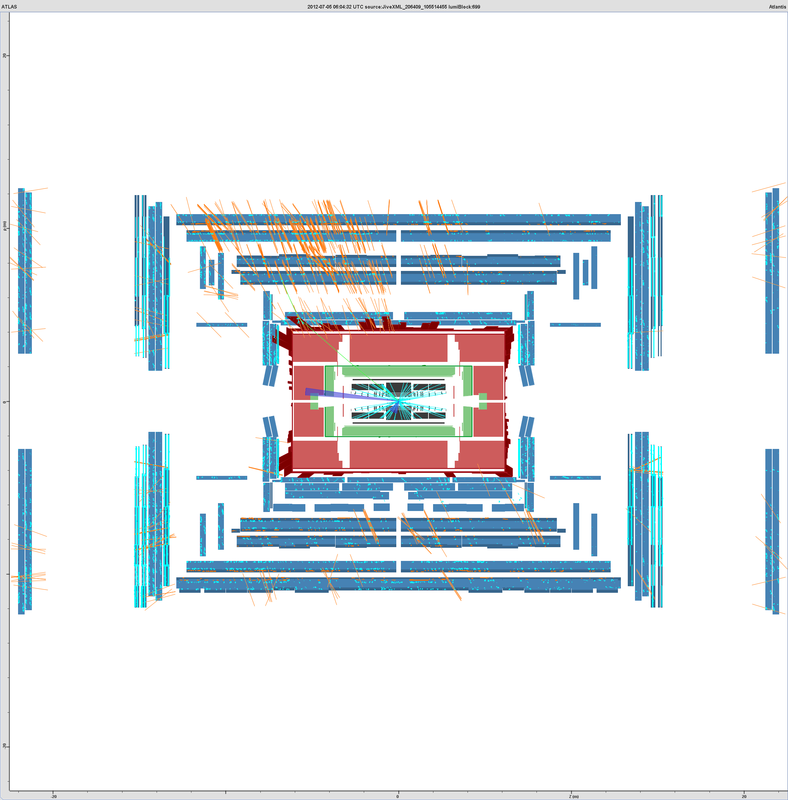 Saving the best for last: a more complicated image, with a few ‘stray’ tracks complicating things. However, when combined the 28 clicks from 7 people form clusters bang on the simulated decay points! 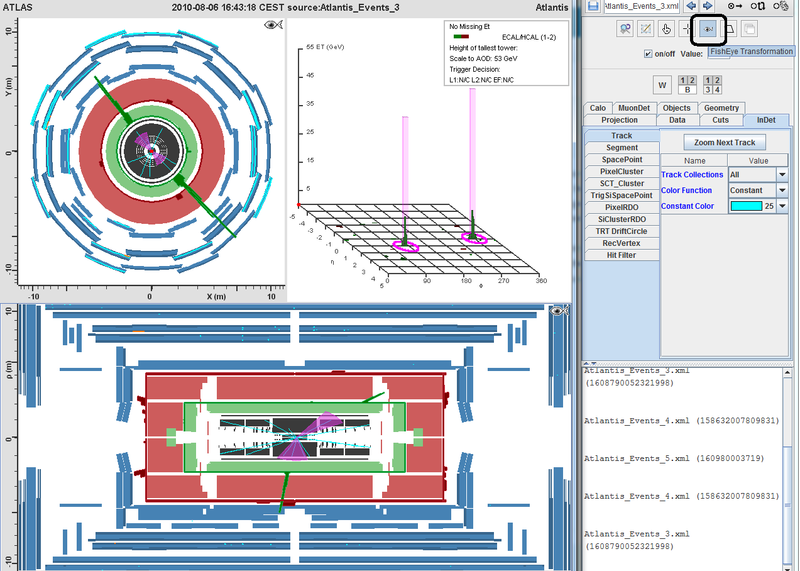 As an aside: the ‘weird’ clicks are marking the little coloured dots you often see in slice views – these are completely expected, and show the positions of all the proton-proton collisions that happened at the same time but at different positions along the beam pipe (which runs horizontally across the centre of the image). It’s great to see you all doing such a good job at finding these OCVs, more analysis to follow! With the 2016 LHC restart well under way, having successfully recovered from attacks by small mammals (BBC article), it’s time to start analysing your clicks in earnest! Over the past year and a half you’ve made more than half a million classifications (thank you! ), and flagged a whole host of interesting features. Over the next few months we’ll be extending the work done by Thomas (e.g. here) on this enlarged dataset to see what we can find out! Stay tuned for more details, and keep on clicking – every image you look at is potentially an as-yet unseen event!